This Pine cone Tray Table Floor Lamp features a small table to display your treasures. Hand-crafted in the U.S.A. with realistic pine branches and pine cones, this floor lamp is complete with a faux calf-skin shade. This Pine cone Tray Table Floor Lamp features a small table to display your treasures. Hand-crafted in the USA. 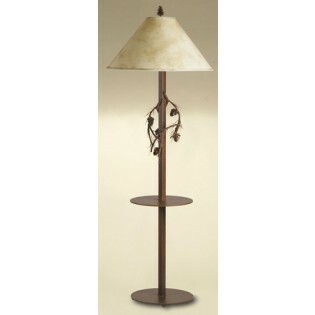 with realistic pine branches and pine cones, this floor lamp is complete with a faux calf-skin shade. Available in your choice of rust or black finish to compliment any decor.